If you are drilling or light milling on longer workpieces the Bohrmax gives you a table bed of anywhere between four to an incredible ten metres, allowing for a single operator and several workstations along the length of the work table for true production line fabrication. Tool changes are automatic, with the option to have every tool you’ll need in a ten-station magazine, while the CNC control and simple, intuitive software and 2D/3D control panel mean you can kiss goodbye to manual marking and enjoy the accuracy of machine-measured tool lengths for precision, peerless control and fast, efficient production. The CNC controls, unlike some, don’t require specialised knowledge and experience. Just a solid 2-3 hours of training will suffice to drill (up to 32mm diameter), mill (round holes or slots up to 500mm across), tap, countersink, ream or flow drill to an accuracy of 0.1mm. 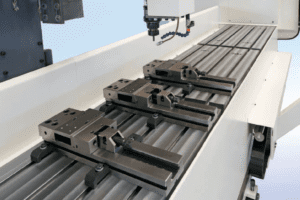 All that on a machine bed that is large enough to take several narrow components side by side, and long enough to nest shorter ones along the bed; one set up for a multitude of parts, all with a standard tooling such as BT40 that you most likely already have.